Well, here we are again! New Year's Eve, 2016. I think we can all agree that 2016 has been a tumultuous year for the world, and we're all going to have to do our part to improve things next year. But as I've mentioned before, this blog is not a news outlet, it's my personal space, so I'm reviewing my year, which has fortunately gone pretty well. It's been strange though, to have spent nearly the whole year outside of the UK, as I've been living and travelling in Asia. Coming home for Christmas is the first time I've been back since last January! Homesickness comes and goes, and some days are tougher than others, but I had to accept that it's part of the deal when I choose to live this way. I started off 2016 still in Scotland, ringing it in at my cousin's wedding reception, surrounded by family, some of whom I don't get to see all that often. This year will be a little different; I'll be on a plane for both midnight in Korea and the UK, and I've no idea what time zone I'll be passing through when it strikes for me! I returned to Hong Kong for the first part of the year, continuing to live and work there as an ESL teacher. I had mixed feelings about the city and the job, but I grew to be very fond of my students, co-workers and friends there, and the city itself. While living there, I got to travel during the school holidays, visiting Cambodia over Lunar New Year, and the Philippines in Easter, as well as exploring all over Hong Kong itself. My mum & sister's visit was a highlight towards the end of the year, and gave me the opportunity to see even more parts of Hong Kong, including Disneyland, and take a day trip to Macau. This was a somewhat stressful time of year too though, as I was approaching the end of my contract in Hong Kong, and had to decide what to do next (which also threw up larger questions about my long term plans, which I don't have answers to!). After investigating various options, doing countless job interviews, and consulting everyone I knew for advice, I eventually decided that while Hong Kong was amazing and it was difficult to say goodbye to everyone there, I had spent enough time there and it was time for a new adventure, in the form of South Korea. Before moving there, I had a few weeks free in the summer, between my contracts, and I got plenty more travelling squeezed in then. First was a couple of weeks traversing Vietnam, and then a few more in the north of Thailand and Laos. Seeing these other countries was the main reason for my initial move to Asia, so I was very happy to check a few more off my list. Then, I flew directly from Laos to Korea, at the end of that trip, and started working there straight away. As with any new place, it takes time to adjust, and the first month or so was hard. I was homesick and lonely, as well as stressed and confused as I tried to figure out life in a new city and country, and it was definitely one of the least enjoyable parts of the year. With time, life in Korea got better, as I adapted to being in a new place. And of course, I utilised any free time I had to see more of the country, such as my trip to Seoul over a long weekend. The job still left a lot to be desired though, with a packed teaching schedule and students that were no where near as well behaved as my Chinese students. They're older too, and considerably less cute, which makes me miss my old kids even more! Teaching English is a good way to see the world, but I don't think I'll be making a career of it... I've lived and worked in Busan since late August, and then was able to take a few extra days (the winter holiday given by the school is very short) to come home for Christmas. I was especially keen to come back to celebrate my Granny's 90th birthday on Christmas Eve, and we managed to get every single family member (all 34 of us!) together for the first time in a very long while to be with her on the day. The rest of the week at home was a mix of spending time with family and just relaxing and enjoying my holiday - which is now over all too fast! Looking back on my goals for the year, it's been a mixed bag of results I think! I've continued to travel, obviously, and blogging is still going well, but I haven't done much writing in any other form. I was aiming to cut back on technology, and while I'm not as addicted to my phone as some people are, I still switch on my laptop to watch TV or just play on the internet after work, so I've still not been reading and writing as much as I'd planned to. I have been out doing things though, especially at the weekends since moving to Korea and having a new place to explore, and I've done more walking and hiking, and yoga has been on-and-off all year. I've been reminding myself it's ok to switch off sometimes too, and not feel guilty about taking it easy, and I even tried meditation a few times recently, though that was largely an attempt to deal with my insomnia. While I've been at home, there's been a lot of thinking and trying to make decisions about the next year (and possibly further), and planning for the future does scare me a lot. It's also been a time of reflecting, in particular regard to the last year and my happiness. For now, all I'll say is that Korea perhaps doesn't agree with me; but I'll save the rest for a future post, when my plans are less up in the air. As for 2016, it's not been perfect (nothing ever is), but I've done a lot of things I wanted to do, seen a fair bit more of the world, and have definitely continued to grow as a person, as travel and living abroad and moving countries continues to challenge me in all manner of ways. I'm having great adventures though, and hopefully will continue to do so next year. And for now, as always, with my lack of long term plans and frequent feelings of confusion, I continue to just muddle though life. 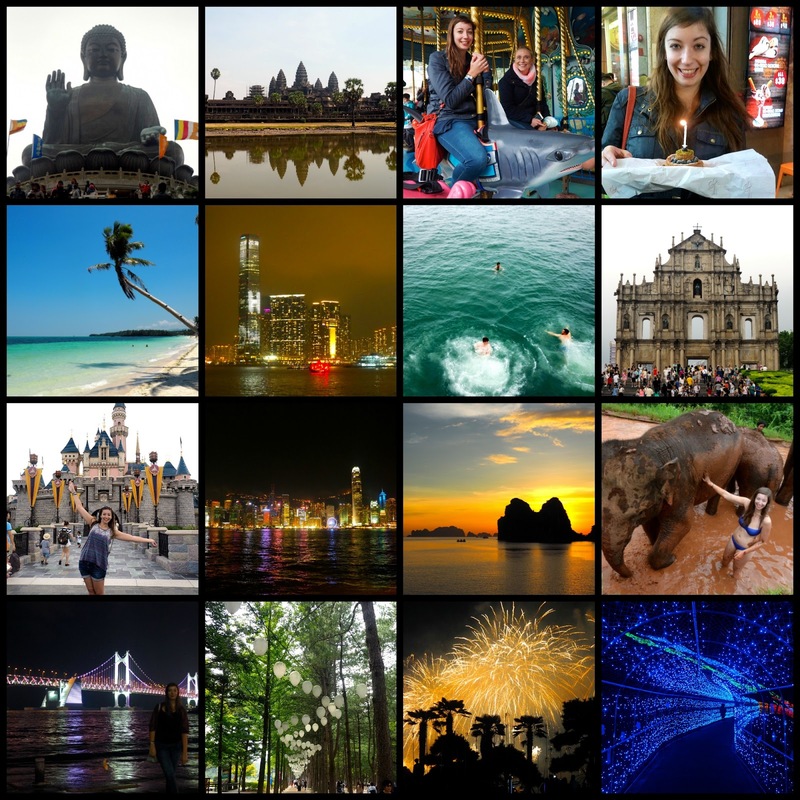 The images are highlights from my year, and most have blog posts to go with them, listed below. Numbers are left to right, top to bottom.